MDX academics lead groundbreaking research - participants needed! We had a number of nominations for the Learning on Screen Awards 2018. At the ceremony, although our student crews won none of the awards that they were formally nominated for, Potty the Plant was awarded a Special Jury Prize as the final presentation of the evening. This adds to what is now a series of awards that this fantastic film has won. 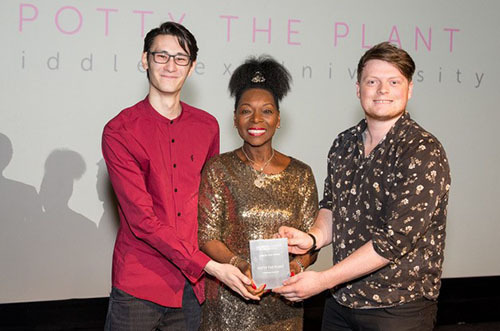 The Learning on Screen Awards by the British Universities Film and Video Council are the UK’s only celebration of film and media in education and research. Since 2005 they have showcased the very best of educational television, recognised the valuable moving image output of the UK’s leading universities, and provided a platform for a generation of upcoming student filmmakers. For 2018 they have revised their awards categories to reflect the latest developments in educational film and media, with new awards for audiovisual essays, student use of archive material and cutting-edge online resources. A massive congratulations to our student nominees at the ceremony, and to the crew of Potty The Plant for their win.